I declare April to be Read a Russian Author Month. 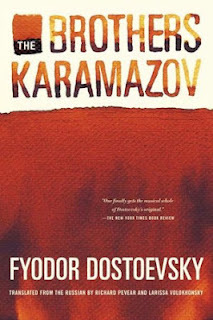 I am reading "The Brothers Karamazov" by Fyodor Dostoevysky (translation by Richard Peaver and Larissa Volokhonsky.) I've spent the past 4 days at the Left Coast Crime mystery conference mixing it up with mystery writers which means I will have a few more new to me authors to talk about. We are also honored this week to be one of the 9 bloggers to host Frank Peretti for his ASK FRANK blog tour. He will be visiting on April 4th so be sure to stop by and give him a big welcome, say hi, ask him a question or two and check out his new book Illusion which I highlighted in week 9. We will be doing a giveaway here and on my blog My Two Blessings in order to give all my readers a chance to participate. Woot! Woot! ALEXEY Fyodorovitch Karamazov was the third son of Fyodor Pavlovitch Karamazov, a landowner well known in our district in his own day, and still remembered among us owing to his gloomy and tragic death, which happened thirteen years ago, and which I shall describe in its proper place. For the present I will only say that this "landowner" -- for so we used to call him, although he hardly spent a day of his life on his own estate -- was a strange type, yet one pretty frequently to be met with, a type abject and vicious and at the same time senseless. But he was one of those senseless persons who are very well capable of looking after their worldly affairs, and, apparently, after nothing else. Fyodor Pavlovitch, for instance, began with next to nothing; his estate was of the smallest; he ran to dine at other men's tables, and fastened on them as a toady, yet at his death it appeared that he had a hundred thousand roubles in hard cash. At the same time, he was all his life one of the most senseless, fantastical fellows in the whole district. I repeat, it was not stupidity -- the majority of these fantastical fellows are shrewd and intelligent enough -- but just senselessness, and a peculiar national form of it. He was married twice, and had three sons, the eldest, Dmitri, by his first wife, and two, Ivan and Alexey, by his second. Fyodor Pavlovitch's first wife, Adelaida Ivanovna, belonged to a fairly rich and distinguished noble family, also landowners in our district, the Miusovs. How it came to pass that an heiress, who was also a beauty, and moreover one of those vigorous intelligent girls, so common in this generation, but sometimes also to be found in the last, could have married such a worthless, puny weakling, as we all called him, I won't attempt to explain. I knew a young lady of the last "romantic" generation who after some years of an enigmatic passion for a gentleman, whom she might quite easily have married at any moment, invented insuperable obstacles to their union, and ended by throwing herself one stormy night into a rather deep and rapid river from a high bank, almost a precipice, and so perished, entirely to satisfy her own caprice, and to be like Shakespeare's Ophelia. Indeed, if this precipice, a chosen and favourite spot of hers, had been less picturesque, if there had been a prosaic flat bank in its place, most likely the suicide would never have taken place. This is a fact, and probably there have been not a few similar instances in the last two or three generations. Adelaida Ivanovna Miusov's action was similarly, no doubt, an echo of other people's ideas, and was due to the irritation caused by lack of mental freedom. She wanted, perhaps, to show her feminine independence, to override class distinctions and the despotism of her family. And a pliable imagination persuaded her, we must suppose, for a brief moment, that Fyodor Pavlovitch, in spite of his parasitic position, was one of the bold and ironical spirits of that progressive epoch, though he was, in fact, an ill-natured buffoon and nothing more. What gave the marriage piquancy was that it was preceded by an elopement, and this greatly captivated Adelaida Ivanovna's fancy. Fyodor Pavlovitch's position at the time made him specially eager for any such enterprise, for he was passionately anxious to make a career in one way or another. To attach himself to a good family and obtain a dowry was an alluring prospect. As for mutual love it did not exist apparently, either in the bride or in him, in spite of Adelaida Ivanovna's beauty. This was, perhaps, a unique case of the kind in the life of Fyodor Pavlovitch, who was always of a voluptuous temper, and ready to run after any petticoat on the slightest encouragement. She seems to have been the only woman who made no particular appeal to his senses. Immediately after the elopement Adelaida Ivanovna discerned in a flash that she had no feeling for her husband but contempt. The marriage accordingly showed itself in its true colours with extraordinary rapidity. Although the family accepted the event pretty quickly and apportioned the runaway bride her dowry, the husband and wife began to lead a most disorderly life, and there were everlasting scenes between them. It was said that the young wife showed incomparably more generosity and dignity than Fyodor Pavlovitch, who, as is now known, got hold of all her money up to twenty five thousand roubles as soon as she received it, so that those thousands were lost to her forever. The little village and the rather fine town house which formed part of her dowry he did his utmost for a long time to transfer to his name, by means of some deed of conveyance. He would probably have succeeded, merely from her moral fatigue and desire to get rid of him, and from the contempt and loathing he aroused by his persistent and shameless importunity. But, fortunately, Adelaida Ivanovna's family intervened and circumvented his greediness. It is known for a fact that frequent fights took place between the husband and wife, but rumour had it that Fyodor Pavlovitch did not beat his wife but was beaten by her, for she was a hot-tempered, bold, dark-browed, impatient woman, possessed of remarkable physical strength. Finally, she left the house and ran away from Fyodor Pavlovitch with a destitute divinity student, leaving Mitya, a child of three years old, in her husband's hands. Immediately Fyodor Pavlovitch introduced a regular harem into the house, and abandoned himself to orgies of drunkenness. In the intervals he used to drive all over the province, complaining tearfully to each and all of Adelaida Ivanovna's having left him, going into details too disgraceful for a husband to mention in regard to his own married life. What seemed to gratify him and flatter his self-love most was to play the ridiculous part of the injured husband, and to parade his woes with embellishments. "One would think that you'd got a promotion, Fyodor Pavlovitch, you seem so pleased in spite of your sorrow," scoffers said to him. Many even added that he was glad of a new comic part in which to play the buffoon, and that it was simply to make it funnier that he pretended to be unaware of his ludicrous position. But, who knows, it may have been simplicity. At last he succeeded in getting on the track of his runaway wife. The poor woman turned out to be in Petersburg, where she had gone with her divinity student, and where she had thrown herself into a life of complete emancipation. Fyodor Pavlovitch at once began bustling about, making preparations to go to Petersburg, with what object he could not himself have said. He would perhaps have really gone; but having determined to do so he felt at once entitled to fortify himself for the journey by another bout of reckless drinking. And just at that time his wife's family received the news of her death in Petersburg. She had died quite suddenly in a garret, according to one story, of typhus, or as another version had it, of starvation. Fyodor Pavlovitch was drunk when he heard of his wife's death, and the story is that he ran out into the street and began shouting with joy, raising his hands to Heaven: "Lord, now lettest Thou Thy servant depart in peace," but others say he wept without restraint like a little child, so much so that people were sorry for him, in spite of the repulsion he inspired. It is quite possible that both versions were true, that he rejoiced at his release, and at the same time wept for her who released him. As a general rule, people, even the wicked, are much more naive and simple-hearted than we suppose. And we ourselves are, too. My challenge to you is to read a Russian author this month. I've already read Leo Tolstoy's War and Peace and was absolutely blown away by how good it was. If you haven't read it yet, be sure to check it out. Finished book #18 this week "A Grown Up Kind of Pretty" by Joshilyn Jackson. This book was fantastic. Clever, witty writing and characters that stay with you long after you finish the book. Looking forward to reading some others by this author. I read it as a 50 years old, and it was challenging! I can't imagine trying to tackle it in middle school! I also finished The Hunger Games Trilogy. WOOHOO! I read Anna Karenina while when I was 14; that's way too young and I got very little out of it. On the other hand, my link this week is very light, but fun. Just finished "The Emancipation of Robert Sadler". The beginning was interesting, but I wasn't too fond of the last part of the book. Hey gang, have special middle of the week post with guest appearance by Frank Peretti. Be sure to check it out.